As much as I love online gaming, if you ask me, nothing beats sitting on a couch and playing with friends. I mean, who doesn’t want the chance to laugh, shout, scream and throw things at each other over a video game? Luckily, there are a few bastion studios committed to preserving this increasingly rare game mode, and I’ve recently stumbled across an absolute gem that’s a total hoot on the couch with your buddies as well as being a blast to play online. Spanish developer Kaia Studios’ Dynasty Feud is a brawler with a lightning pace to its gameplay, a massive roster of unique characters and an inventive tag system. Over the past week, I’ve been busy playing it both online and with friends and it’s produced some of the most memorable multiplayer action I’ve enjoyed in quite some time. The brawler genre has seen a bit of a resurgence recently, with popular games like Towerfall Ascension bringing it back into the mainstream fold beyond just the iconic Nintendo IP, Smash Bros. But while Dynasty Feud does certainly take a few cues from those aforementioned titles, there’s much more to it than just another brawler in different clothing. Dynasty Feud stands on its own two feet, innovating by introducing combinations of familiar mechanics while throwing some all new ones into the mix, too. Rather than just battling with a single hero, in Dynasty Feud, players select a number of characters to the sum of 10 stars. Not every character is valued the same, however, with those commanding special abilities or strengths worth more. Indeed, each of the game’s 40 characters – brought to life with an endearing, cutesy art style – boast unique moves and attributes. Players will want to choose wisely how they spend stars. But here’s where things get really interesting: because the combat is 1-hit kill, as soon as a character is knocked out, players immediately chose another to tag in and take over. Needless to say, there’s plenty of rotation going on. At first, that might sound like an exercise in frustration in a fast paced brawler, but stick with me. This unorthodox combination totally works, constantly changing the flow of battle and forcing players to think strategically. Repeatedly tagging in and out with different characters makes for hilariously unpredictable moments throughout each round. It also takes the edge off dying since you’re given a chance to execute a new strategy each time. Quite apart from all that, though, it also means no two battles are ever going to follow the same beat. The characters themselves are all unique in design and ability, and their perks and vulnerabilities are all in accordance with which clan they are affiliated. For example, The Cartwrong clan are weak at melee but possess solid long range attacks, which might cause one to swap out for them versus an opponent with similar ability. But the entire pace of the battle is likely to change in an instant once that opposing character is defeated and another character with a different skillset enters the fray. It’s a constant juggle of character management, which certainly adds a nice tactical element. There are special moves for each, too, depending on their clan. The Norse Yingling dynasty, for example, summons a ghost to hurl lightning strikes at enemy combatants. Adding to the frantic pace of battle are the level designs and destructible environments. 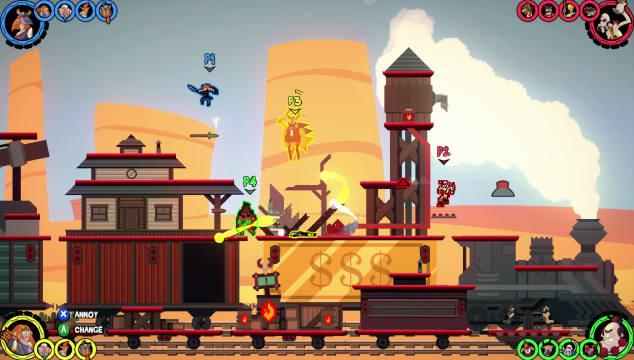 Dynasty Feud’s aesthetic really pops in the heat of battle, atop medieval castles as walls crumble under the ensuing chaos, or aboard moving trains as the landscape whizzes past while trying to dodge your opponent’s special move. Amid intense 4 player battles with different characters popping in and out of battle, Dynasty Feud is sometimes a hectic blur with a tempo that takes a few rounds to adjust to. Once you’re up to speed, however, you won’t want to put it down. So, what’s next for Dynasty Feud and Kaia Studios? Eneko Egiluz hasn’t ruled out introducing updates to the game in the form of new characters and dynasties. Personally, I’d love to see what the team can do using different cultures as inspiration. Perhaps there’s even room to combine them in a weird mashup of sorts? As for future games in the works, Egiluz told me the team hasn’t gotten together yet to discuss, but based on how positive reception has been to Dynasty Feud, the future certainly looks bright for Kaia Studios. Dynasty Feud is available now on PC via Steam and the game supports online as well as up to 4 player local multiplayer.